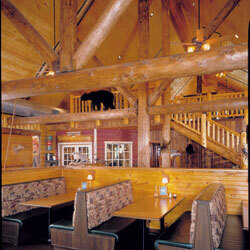 Expedition Log Homes- Midwest can showcase your company or business in ways that no other company can! 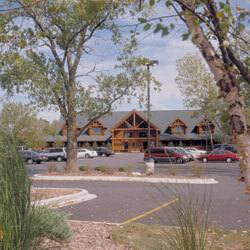 Expedition Log Homes Midwest- Commercial Division(CD) was developed to work with a new or existing business to give it that unique look and feel that makes it stand out from your competition. 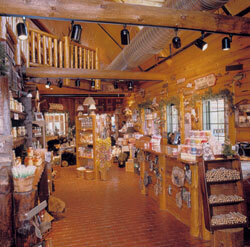 Whether it's a custom log store front on a manufacturing business, a log accented mall location, a custom real estate office, a standalone restaurant or store- Expedition Log Homes CD is the right choice to help you grow your business. 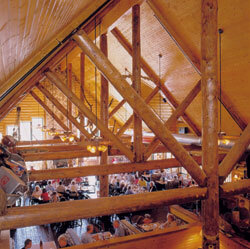 Expedition Log Homes unique half-log insulated building system lends itself well to commercial projects. It combines the engineering and strength of conventional framing and construction with our kiln-dried half-log siding with full log corners to give you the "look and feel" of full log construction. We are able to offer you a "full log" exterior look and still give you fully insulated walls(R30) and roofs(R42)-making your structure extremely energy efficient. Please see our Log Home Specifications page This system also allows for conventional plumbing and wiring systems making it more cost effective to build. Expedition can offer you many interior design options including interior log siding, log tie-beams & log rafters, knotty pine or cedar paneling, log posts, log stairs railings. We offer windows and doors from Pella Window & Door Company and roofing from CertainTeed for asphalt roofs and we have access standing seam to metal roof systems. We also offer you many special design options including- custom log styles and sizes for both interior and exterior use, special log accents and custom log furniture options from Moosehead Log Furniture Co., and the list goes on! 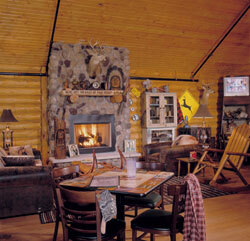 Combine this with your business' needs and our award winning design and engineering team at Expedition Log Homes Midwest- CD and you can be assured of a structure that will be designed to the highest standards, built of the highest quality materials. 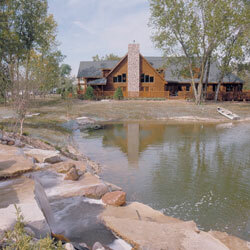 Expedition Log Homes Midwest-CD also specializes in lodge, resort, and cabin projects. We can offer special pricing plans to developers who are looking to build and re-sell cabins and we offer a great incentive plan to resort owners, camp designers, and contractors. Expedition also offers a referral plan to business' that make their commercial structure available for viewing and has literature on hand for distribution. This is known as our Project Referral Program and it can be a great way to generate extra income from your Expedition commercial building. Please contact us today to discuss your commercial building needs. 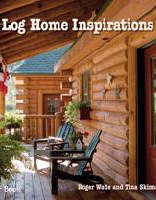 We can be reached at 1-800-426-5647 or jay@logdreams.com You can also click Log Home Information and it will direct you to our information sheet. Please fill it out as completely as possible and check the "commercial" box, you can also leave us your ideas in the comments box at the bottom of the page. We will then contact you promptly. 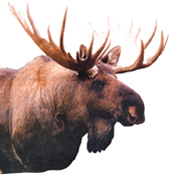 Thanks you for your interest in Expedition Log Homes Midwest- Commercial Division and we look forward to helping you grow your business!